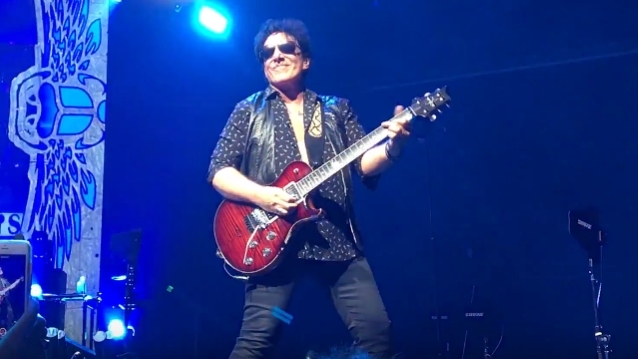 JOURNEY guitarist Neal Schon paid tribute to Aretha Franklin during the band's August 17 concert at the BB&T Center in Sunrise, Florida. Schon posted a clip of the performance on his official Instagram account, along with the following message: "I did tribute to Aretha Franklin- Queen Soul R.I.P. with much Love & RESPECT." In a separate Instagram post, Schon wrote: "I've been paying respect to Aretha during my solo spot in our shows. She was the best and Huge inspiration not only as an artist but kind to all." Franklin, the "Queen of Soul," died Thursday after it was reported last week that she was "gravely ill" in Detroit. Her family said that the cause of death was advanced pancreatic cancer of the neuroendocrine type. In 1987, Franklin became the first woman to be inducted into the Rock And Roll Hall Of Fame, and was later named the "Greatest Singer of All Time" by Rolling Stone. JOURNEY's current North American co-headlining tour with DEF LEPPARD has already surpassed $50 million in sales, based on box office totals from 33 shows reported to Pollstar. The final stop on the 20-week jaunt will be a two-night engagement at the Forum in Inglewood, California on October 6-7.